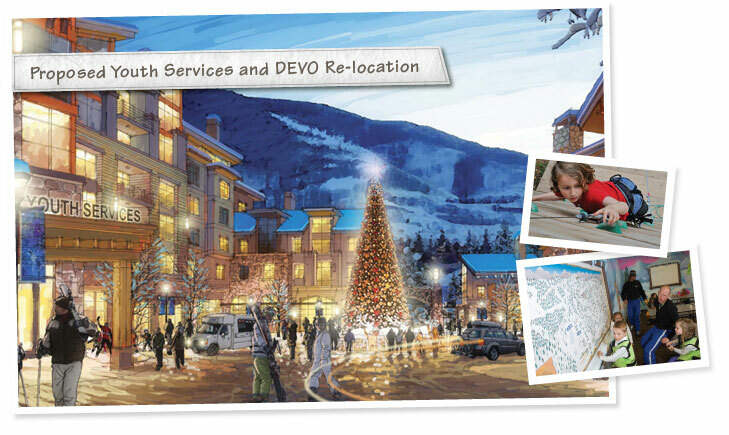 Ever Vail, LLC, an affiliate of Vail Resorts Development Company (VRDC), updated its plans and application materials in November 2010 for the Ever Vail re-development project. The revised plans reduce commercial space by more than 30 percent, and also include revisions to the Red Sandstone Creek corridor creating a larger open park-like area through the middle of the nearly 12-acre site. 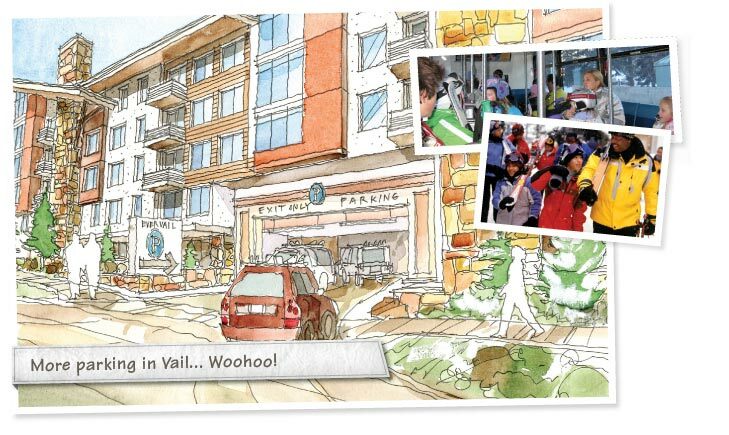 The proposed Ever Vail redevelopment project is currently under review by the Town of Vail. We appreciate the time you are taking to review our plans and provide us with comments or question. 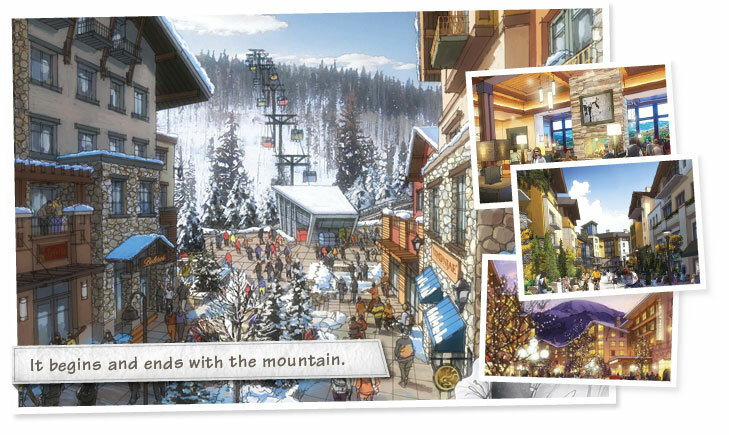 We believe this the right time to seek approval of our project because when the economy does turn around, Vail will be one of the few - if not the only - resort communities to have a new and exciting story to tell! The gondola plaza will be a center of energy within Ever Vail. A proposed new portal to Vail Mountain will help alleviate congestion at other portals and allow skiers to access the mountain with a mid-point stop at the base of Chair 26 and a terminal at Eagle’s Nest. 400 publicly-available parking spaces are proposed beyond the required parking for uses on the site. The Town�s master plan suggests that the property accommodate public parking in this area. Ever Vail took this master plan goal one giant step forward by not only accommodating for the 400 parking spaces but actually proposing to pay for their construction at no impact to the Town. With the required parking to serve retail uses on the property, the proposal includes about 670 spaces available to skiers and consumers. Relocation of the weekend DEVO program from Golden Peak to Ever Vail will help relieve current congestion. An additional 50 parking spaces are intended to be provided on the western portion of Ever Vail and designated as short-term parking for DEVO drop-off and pick-up. 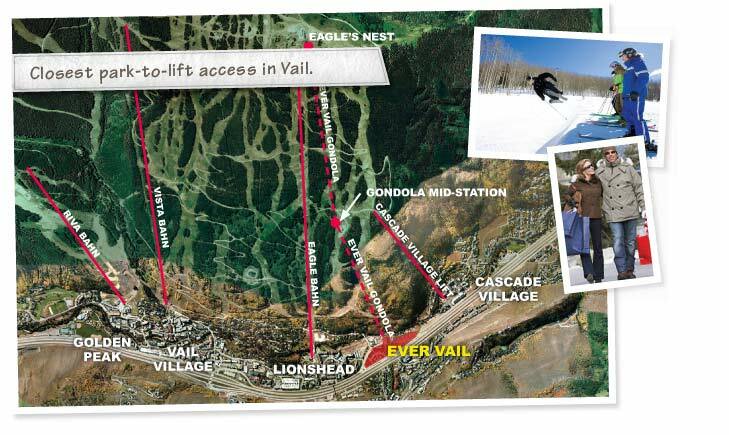 A new gondola is proposed to serve the skier parking spaces and the uses within Ever Vail. Skier drop-off and parking are all located within 400 feet of the gondola providing the closest par-to-lift access in Vail. The proposed Ever Vail mixed-use project will redevelop a nearly 12-acre site. The nearly 12-acre site is currently home to an aging maintenance facility, office buildings and a former gas station, providing the much-needed in-fill development to create a connection between Lionshead Village and Cascade Village. It will bring together mountain operations, affordable and free-market housing, and community benefits. The 12K sf recreational facility for the Vail Recreation District�s Youth Services includes an 80-foot-tall climbing wall within a glassed structure acting as an iconic element for the project. The relocation of the weekend DEVO program from Golden Peak to Ever Vail remains in the plans, thus reducing the congestion problems encountered along Vail Valley Drive. Revisions to the Red Sandstone Creek corridor are proposed to create a larger open park-like area. One of the two pedestrian bridges across Red Sandstone Creek has been eliminated; a new pedestrian and bicycle bridge across Gore Creek has been added, making the project much more accessible to the Gore Creek trail. Ever Vail is also proposing to grant a conservation easement for Red Sandstone Creek to the Town, which today runs across private property, as suggested by the Town’s Comprehensive Open Lands Plan.